POST NOTE: The bird was about 50-60 feet away in the top pic as it had flown into a woodpile about 50 feet from me. The bird was more than 75 feet away in the bottom pic and on the other side of a barbed wire fence (slightly visible) in a field. 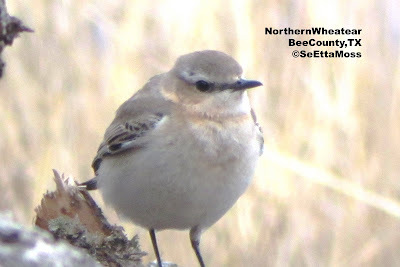 In the top video clip the Northern Wheatear I videoscoped on Jan 6 in Bee County,Texas actually perches in one position for 19 seconds (quite awhile for this bird) on top the wood-pile then quickly flies down out of view. POST NOTE: I took these pics by putting my camera up to my spotting scope which provides super enlargement. The bird had flown into a wood pile about 50 feet from me as I was talking to the property owners brother so the bird was from about 50-75 feet in these digiscoped pics. I have cropped the pics to enlarge them. I got to see another big rarity that was located north of Corpus Chrisi,Tx. This was another easy decision as it was less than a 20 mile detour off the highway I was taking north to San Antonio, on the first leg of my trip home. 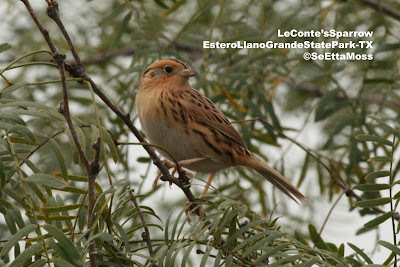 Having found two LeConte's Sparrows in a week was made sweeter when this bird came out into the open and stayed put for at least 5 minutes while I snapped pics and slowly approached closer. I was very pleased to get the top pic that shows the bird's nape quite nicely. I got these pics from only about 25 feet away. 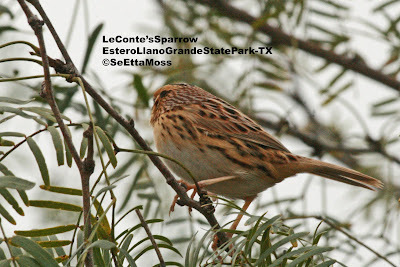 At the CBC compilation we found out there were about 5 LeConte's Sparrows found on this count and all were in or around the Estero Llano Grande State Park.